Saturday, September 14 1907 -- Joe Gans returns to LA triumphant after his victory against Britt, now Memsic will get his chance. Sunday, September 15 1907 -- Hen Berry, owner of the Angels, was presented recently with a large, gaudy opal tiepin by an admirer. The tiepin was presented as a good-luck charm, and the Angels did indeed promptly go on a bit of a tear. Berry took this as a sign that he would redouble his luck if the rest of his garb were as loud and obnoxious as the bauble now holding down his tie. So he bought himself a complete new wardrobe heavy on eye-blistering colors and miasmic patterns. The story is of enough interest to merit a gigantic page-width Sunday cartoon and a long story from sportwriter C.E. Van Loan. Ah, the good old days when 'juiced' haberdashery was the biggest scandal reported in the sports section. 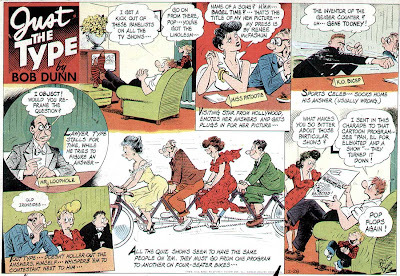 Bob Dunn, who had the uncredited job of assisting/ghosting for Jimmy Hatlo on They'll Do It Every Time, got to take credit on this very similarly themed Sunday strip called Just The Type. Never a syndication success, King Features may well have let him do the feature just to keep him happy while working on the Hatlo cash cow feature. Just The Type ran in the New York Journal-American and darn few other papers from May 5 1946 to November 24 1963, a very respectable run. When Hatlo died in 1963, though, Dunn's workload presumably got that much heavier and Just The Type was dropped. Dunn finally got an official byline on They'll Do It Every Time starting in 1966. Thanks to Cole Johnson for the lovely scans from syndicate proofs. Was he prescient (looking ahead to bold '80s New Wave), or what? "I am impressed with the way influential New York papers are displayed with the color comics on the outside," observed A. D. Gorfain, owner of Press Feature Service, Sydney, Australia. "These huge papers—and what they display is the comic strips! "When we get to that stage in Australia, I will think we have really arrived." The 38-year-old syndicate head was the man behind "Streetcar Named Desire" in Australia. He distributes London Express features, which included the Desire dialogue. Australian representative for General Features and Press Features, New York, he owns his country's second largest feature dispensary. It's first, he adds, in the number of features produced. 2. Nine of the 11 work on children's puzzle and brain-stimulator features. The syndicate has created 800 original puzzles for children in four and a half years. 4. The country is considered "blanketed" with a feature when it runs in a capital city paper in each of the six states. 5. Mr. Gorfain's syndicate produces comic books arid children's books (for publishing by other firms) as well as newspaper features. There are some "likes" too. Press Feature Service frequently serializes important non-fiction. However, serials of inspirational books are not a fad. 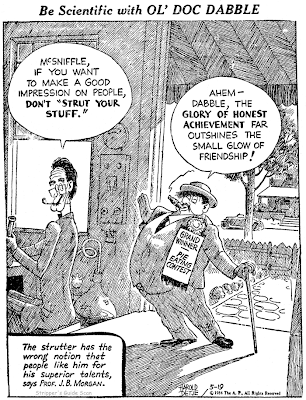 Perhaps the greatest kinship, Mr. Gorfain indicates, is in taste in comic strips. Australians like both gag and adventure strips — possibly in equal proportion—and have a sense of humor more American than British, he believes. 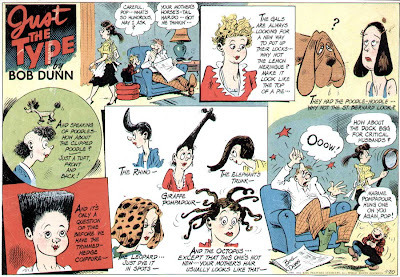 One of his Sunday comics,"Holly," drawn by 19-year-old June Shoesmith could be a sister to Harry Haenigsen's "Penny." "American comics are very popular in Australia," Mr. Gorfain comments. "And as a syndicate we rather like that. It keeps us on our toes." Mr. Gorfain at one time booked films for Metro Goldwyn Mayer but after serving five years in the Royal Australian Air Force decided there was opportunity in the feature field. His trip here was via England and Canada where he placed with syndicates both the children's features and a "Cross-quiz" — a crossword puzzle with every clue a question. He has secured rights to produce a comic strip based on the work of Peter Cheyney—a leading British writer of crime thrillers. 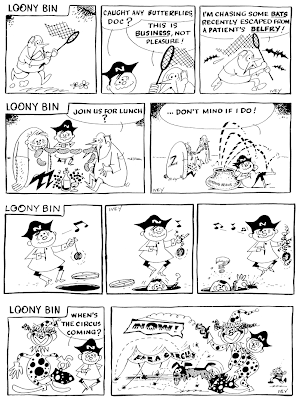 Some of the well-illustrated papers in Australia, carry 12 daily comics, and big Sunday color comic sections. You do realize that this article is 60 years old? I imagine Mr. Gorfain has gone to his reward. no i did not realize that - thanks. In the 1930s it seemed like every Artie, Inky and Chalkie was pressed into service to duplicate the success of Robert Ripley's huge hit, Believe It or Not. When the inevitable time came for the Associated Press to add yet another 'me-too' feature to their comics page offerings, though, bless their hearts for taking the road less travelled. Be Scientific, as the feature was initially called, started out as pretty much a straight clone of the Ripley feature. The only differences were that the daily panel (there was no Sunday for any AP feature until much later) concentrated on one subject per day instead of the scattershot approach favored by Ripley, and the accent was on science factoids rather than on oddities. Harold Detje, the creator of the feature, soon tired of his clone act and introduced a pair of characters to his panel, Doc Dabble and his sidekick, McSniffle. The panel got a new name, Be Scientific with Ol' Doc Dabble, and the factoid of the day was now the subject of the day's gag. Some gags worked well, some didn't, but at least Detje was doing something different than the rest of the pack. The new format also showcased Detje's cartooning skills rather than his technical drawing, which wasn't exactly making for a graphically interesting panel. 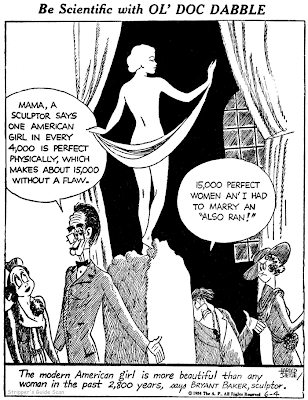 The AP had a set number of features, and Be Scientific replaced Al Burtis' cartoon panel when he was reassigned to producing a strip, The Dillys. Be Scientific debuted on June 6 1932 and ran until June 15 1935, when it was in turn replaced by Oaky Doaks. According to my admittedly quite fallible memory, Detje dropped the feature to become syndicate editor for the AP. I'm pretty sure I read that somewhere, but I can't come up with the source at the moment. My name is Jennifer Thelen-deGreef and I am the great granddaughter of Harold Detje. I was so pleased to read the info you have here and to see some of his works that I never have before. I do believe that your info is correct regarding Harold becoming syndicate editor for the AP. If I can add anything later I will gladly contact you in the future. Thanks for writing Jennifer! Anything else you can tell us about great grandpa would be warmly welcomed. 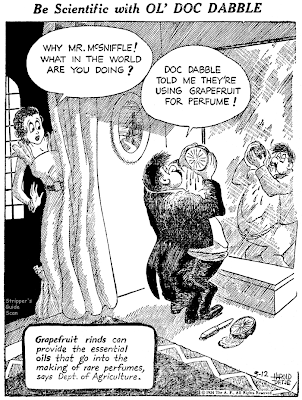 Obscurity of the Day: Now, What D'Ye Think Of That? Looking at this strip you're probably thinking that it's the sort of oddball thing that probably lasted a couple of weeks. Most emphatically not so! While I get no impression that it was a particular favorite of newspaper readers, Hearst's New York papers ran Now, What D'Ye Think Of That? over a span of five years, a very impressive run in that formative era of the 1900s. The creator of the strip signed himself as Childe Harold. If that name sounds vaguely familiar to you, thank a literature teacher. The original Childe Harold was a fictional character created by Lord Byron. He wrote an epic-length poem titled Childe Harold's Pilgrimage, the story of a world-weary young man and his travels. The term 'Childe' originated in medieval England to denote a young man who was in training to become a knight. Later on the term became more general, referring to either a youngster or one who is naive, or young at heart. Byron's poem inspired various 19th century artists to take on 'Childe' as part of their nom de plume. Best remembered of the group is Childe Hassam, a painter of great renown. Childe Harold seems to have taken on the name to celebrate his unsophisticated drawing style and to evoke the old-timey setting of his strips . His real name was Edward Salisbury Field. The strip told its gags in rhyme, and obviously Harold was much more interested in producing poetry than in getting a big laugh from the reader. I suspect that Childe Harold considered himself quite the 'artiste', though he never produced a serious book of poetry as far as I know. He did, however, write and illustrate several volumes of light verse under his pen-name, and a number of other works under his real name, most notably the bestseller A Six-Cylinder Courtship. Muche thankes to Cole Johnson for the scans. Nell Brinkley was an icon for several generations of women, and Robbins' estimate that she was the most copied artist of her era could very well be true. What Brinkley lacked in formal capability (her anatomy was often pretty questionable) she more than made up for with her dense, florid, uniquely feminine style. Women were utterly captivated by her romance illustrations (she rarely did anything outside that genre) and she had an intensely loyal following among not only readers but other women illustrators. 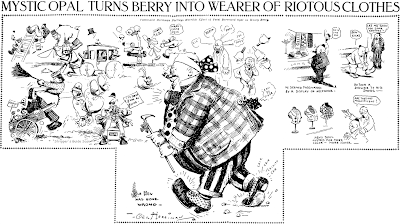 In fact, if you were a female illustrator or cartoonist in the 1910s or 20s and didn't draw at least a little like Brinkley you were considered a bit of an oddball. That this gorgeously produced, oversized book contains her best work is debatable because it concentrates almost exclusively on her color covers for the Hearst Sunday newspaper magazine section. This work is certainly her most impressive so I guess "best" is not necessarily misapplied. 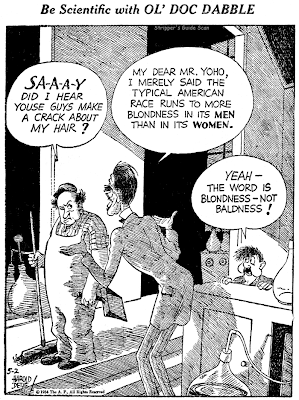 However, it would have been nice to devote at least a short section to Brinkley's black and white cartoons, which certainly are the bulk of her published work, and what she's remembered for. I suppose Robbins didn't want to waste her 9.5" by 13" coated-stock pages on work that could run in a less prestigious format. Fair enough. The reproduction of the old color pages, always a dicey proposition, is handled here very well. The art has been beautifully restored, a task that must have been pure torture given the density of Brinkley's drawings and that sophisticated color work. My hat's off to whoever did that fabulous job. My only problem with the book, and I may be starting to sound like a broken record on the subject, is that I would have liked to have more editorial matter. I realize that this is a coffee table book, and the art is necessarily the star, but Robbins knows her subject and I would have appreciated hearing more from her than the capsule bio provided. Another item that would have been welcome is a complete list of Brinkley's magazine cover features and their running dates. Some of Brinkley's series are reprinted her in their complete runs, while others are missing pages and yet others are individual samples. A real Brinkley fan would want to know what they need to be on the lookout for to complete their collections. This book is an accounting of a very strange episode in the journalism history of the 19th century. For a few short years in the early 1840s a small group of entrepreneurs created a whole new sort of newspaper. 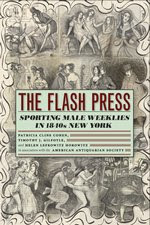 The "flash press", as they were known at the time, were a group of newspapers that chronicled the sexual underworld. These papers discussed and reviewed, often in startling frank terms, the world of bordellos, prostitutes, pimps, and johns. They overlaid a thin, VERY thin, veneer of moral objection that kept their operations from being shut down, at least for awhile, but their clear purpose was to keep potential customers up to date on the happenings in the skin trade. Now my readings in journalism history are normally limited to the age of the newspaper comic strip, but how could I resist a book about such a subject? I was expecting a rollicking account of these amazing Victorian relics, but I hadn't reckoned on the authors' scholarly approach. The first half of the book consists of dry, pedantic essays about the newspapers and early Victorian sexual politics. The authors absolutely refuse to have any fun with their subject, quite an achievement really given the subject matter, and I had to force myself to keep reading. 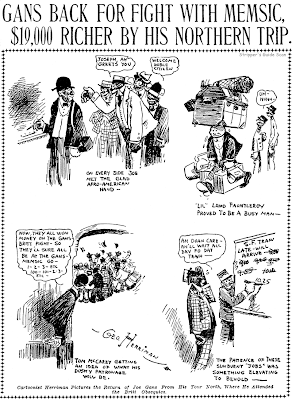 The second half of the book is considerably more lively, featuring excerpts from the newspapers themselves, including many racy woodcut cartoons. I was so worn down from the essays by then that I didn't enjoy the material as much as I should have. If you are sufficiently interested in the subject to buy the book, I suggest you read part two and then, if your thirst for knowledge about the papers remains high, tackle the essays only then. The front matter does in fact provide important history, context and background, but the information goes down much easier once you've had the chance to get some firsthand experience with these utterly crazy newspapers. Re Trina's Brinkley book. It should be remembered that she has already covered much of what you feel is missing in this one. 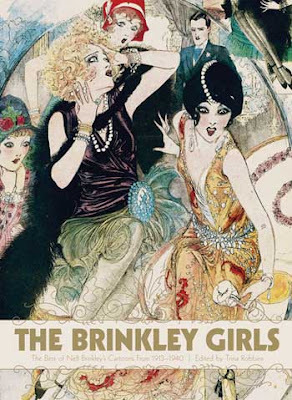 I refer to her excellent 2001 book, 'Nell Brinkley and the New Woman in the early 20th Century', a small format volume of 144 pages, with no color repro and a focus on her black and white work. If one is read in tandem with the other, then all bases are covered. well, except for the completist listings. I don't think Trina thinks that way. oops. Another thing. I may have got more out of the 'dry pedantic essays' of Flash Press than you did, and I wrote about it here. The comings and goings of personalities in the publishing world would normally have interested you. I guess, as you say, it just wasn't your period. Agreed, I should have mentioned the prior Brinkley book. Be assured that I do indeed recommend it, and I think you've made the ideal suggestion -- read the two together. As for Flash Press, I stick with my review -- the essays might be learned but they are dead set against having any fun at all with this utterly ridiculous subject. If I'd known that the book contained academic deconstructionist essays I would have given it a pass, just as I would if the subject were deadpan analyses of the New York Evening Graphic or the National Enquirer. The academic dogma that you can't have fun when writing about history, especially the loopy bits, is anathema to me. It might be expected/required in your master's thesis, but I have no patience for such belly-button gazing.